If you’re moving house, it makes sense to choose a company that can offer you complete commitment and care. Camp Hopson is that company. Although we move people every day, we realise that, for you, it could be a time of stress and upheaval. Because we’re familiar with the area, we can move you in or out of Marlborough and head off all the problems before they arise, so that you have a smooth and pleasant experience. It doesn’t have to be the exhausting slog it’s fabled for being. We maintain a highly-trained and fully-experienced staff – they can help you with every aspect of packing, taking on all the heavy lifting, getting all your possessions wrapped up and boxed so that moving day becomes a cinch. Solutions are what we’re all about, and we’re proud of the work we do. We know that not all removal companies in Marlborough maintain the same standard and that you may have been burned in the past. We’re here to remedy that and to move you with all the consideration we’d extend to ourselves if we were moving. Your belongings will be cared for as if they were our own and we’ll take extra care to keep them safe in transit. 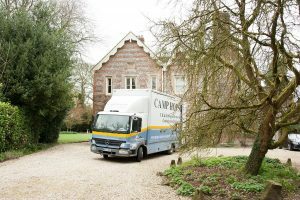 Camp Hopson Removals Limited is the name to remember – make a note of our details and when you’re ready, get in touch. From the moment you telephone us, you’ll notice the difference – our estimator will visit you to grasp all the details of your move and then you’ll be supplied with an accurate and clear quotation. If you require storage in Marlborough, then you’ve come to the right place. Our facilities can accommodate all needs – small, large and everything in between. We carefully categorise all items and then supply you with a precise inventory. For as long as you need, your goods will be safe with us and then, when you need them back, they’ll be delivered right to your doorstep. Our seven decades of removals and storage mean we come with an expertise of the kind that cannot be acquired overnight. So when you need a removals company in Marlborough, there’s no need to look any further. We’re here.